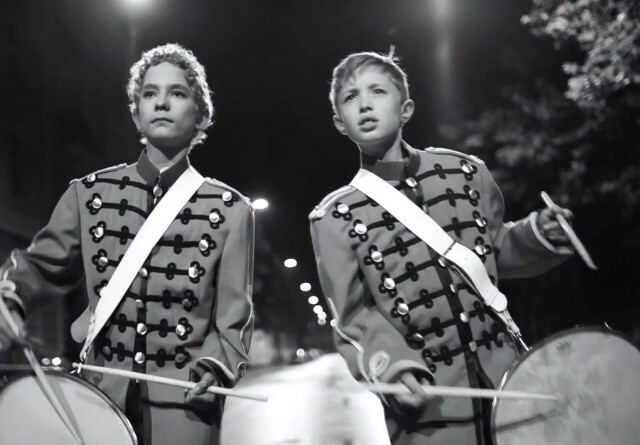 In the Raveonettes’ video for the fuzzily romantic Observator cut “Curse The Night,” two little kids dress up as drummer boys and lead a youngster mob through inky black-and-white streets. Things then take a surprisingly villainous turn that I don’t want to spoil. Watch the video and check out a (long) statement from the Danish directing duo Storm/Hansen. When we first started talking to the band about making a video for “Curse The Night” it turned out we’d all be in Copenhagen at the same time in September, so we decided to shoot the video there. We all used to live in the city, but moved to Los Angeles or New York years ago. We thought it’d be a cool way for the band to show their fans where they are from and since we’ve never shot a video in Copenhagen, we saw an opportunity to revisit the city with fresh eyes and portray it in a new light. Copenhagen is ancient and has an architectural history you’ll only find on the Universal back-lot in the US. When you live abroad for a while you start seeing your hometown through the eyes of a tourist and discover new aspects you never thought interesting or worthwhile. “Curse The Night” is an extremely visual song and required an atmospheric video to go with the moody track. We knew from the minute we heard it that it had to be in black and white. There’s a loneliness and solitude to the music that called for an empty city at night and we actually came up with two very different ideas that we pitched to Sune and Sharin. In one idea only they would be in the video and in the other, they wouldn’t be in it at all. They chose the idea where they weren’t in it at all… That was also by far the most ambitious idea of the two. The core of the video was inspired by the drumbeat in the beginning of the track. We came up with the idea of two kids with drums gathering a motley crew of youngsters in an empty city after dark. Towards the end of the song there’s a very melodic bridge that breaks from the rest of the track and we knew we need some sort of twist or climax here. We had several ideas, but didn’t know exactly what it should be, so we started a constructive brainstorm with the band. It was important for them to include an element of surprise, something unexpected that wasn’t a cute finale and that’s how we came to the ending that’s now in the video. You basically take the story of The Pied Piper and mix it with The Town or Point Break and you have the plot. Once we all agreed on that idea, we were more or less free to do what we wanted. They started their tour and we got to work. Ordinarily we produce our videos through our LA based production company, The Kompany Entertainment, but this time our Scandinavian rep Kasper Graversen and Minerva Film produced in Copenhagen. Denmark. Weather is ridiculously unpredictable and we didn’t have any contingency for rain or children catching the flu. We knew we wanted the ending to take place on this very iconic bridge in Copenhagen, so we had to make sure the streetlights were all working. Locking it off meant we couldn’t start shooting until after midnight and since we wanted to create the illusion of a deserted city, we shot mid-week when party people stayed home. We were still only allowed to block traffic 3-4 minutes at a time, so there was a lot of running on and off the bridge along with long periods of waiting while busses, cabs and cyclist crossed the bridge in intervals. We decided to spend what money we had in the key places that we knew we needed in just in order to make the video at all. That included a light sensitive camera, our key location and the main prop – the armored CIT vehicle. For the rest we had to pull in every favor we could. The Raveonettes carry a lot of goodwill so a lot of people were willing to help. We were also able to find a couple of very hard working volunteers that became crucial in everything from coordinating, casting, production design etc. We had very specific ideas about almost everything in the video. From props to costumes to casting. We saw about 50 children before we decided on our posse of seven. The kids (and their parents) were amazing. None of them had been up later than midnight before and now they all had to stay awake till 5 am – several school nights in a row. Fortunately they thought the whole thing was a blast and unlimited sodas and candy can create a lot of insane energy. We wrapped at 8am the last night and started editing right away. Fortunately we were able to shoot almost exactly what we set out to get, so when we presented to first cut to the band there weren’t many notes. We were all basically on the same page, so the whole post process was easy. Despite the extreme conditions and total lack of sleep we’re very pleased with how the video turned out. Observator is out now on Vice.